I wish I could tell you where this recipe came from. When I was transferring a bunch of recipes I had scribbled down on scraps of paper into my Evernote account, I came across this recipe and it reminded me that it had been awhile since we’d had quiche. A note I had written to myself about it being THE BEST (I had actually written that in all capital letters so you know I was serious) prompted me to refresh my memory and make it one night last week for dinner. One of the best things about this recipe is that you can use any veggie or protein you want, which means you’ve got a whole lot of different flavor combination possibilities here. In the original recipe it called for ham and broccoli and I know that’s probably how I made it originally, but I only had some spicy smoked sausage and a yellow bell pepper on hand, so that’s what I used this time. Make it your own! Preheat your oven to 375F. 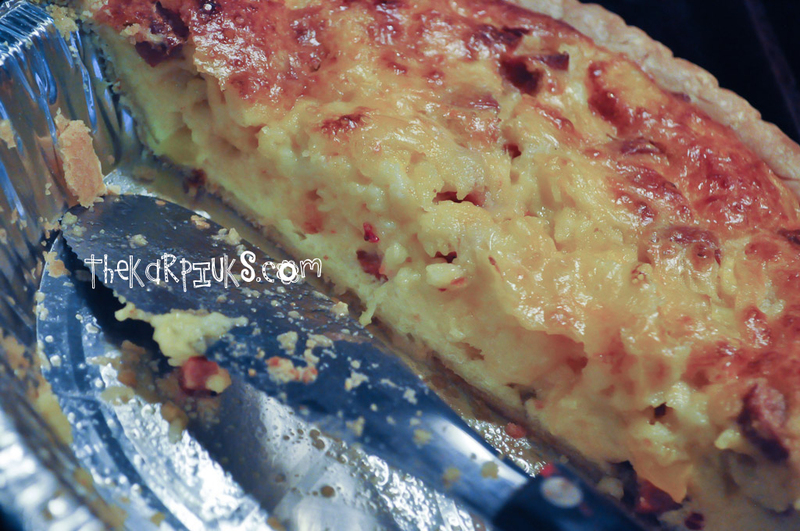 I like using a frozen ready-made pie crust, or you can just grease a quiche dish and make your quiche crustless. (No crust definitely cuts down on the carbs and calories!) I also grabbed 4-6 muffin liners and put them in a muffin tin to bake any leftover mixture as “muffins” for our 2 year old. Optionally you could use oven-safe ramekins for older kiddos, so they have their own individual serving. In a large bowl, beat together the first five ingredients; everything but your veggies, protein, and shredded cheddar cheese. The base mixture is supposed to be lumpy! Add in your veggies and protein and stir. As you’re stirring, add in the shredded cheddar a little at a time until it has all been blended in well throughout. Pour mixture into your prepared crust or quiche dish. I used a 9″ deep dish pie crust and had some leftover mixture – just enough to make 4 “muffins” by filling the paper muffin liners about 3/4 full. Bake your quiche for 50-55 minutes. The eggs should be set in the center and the top should be golden brown. Keep an eye on your little quiche muffins; they’ll be ready around 35 minutes in, so you can pull those from the oven when they’re done. 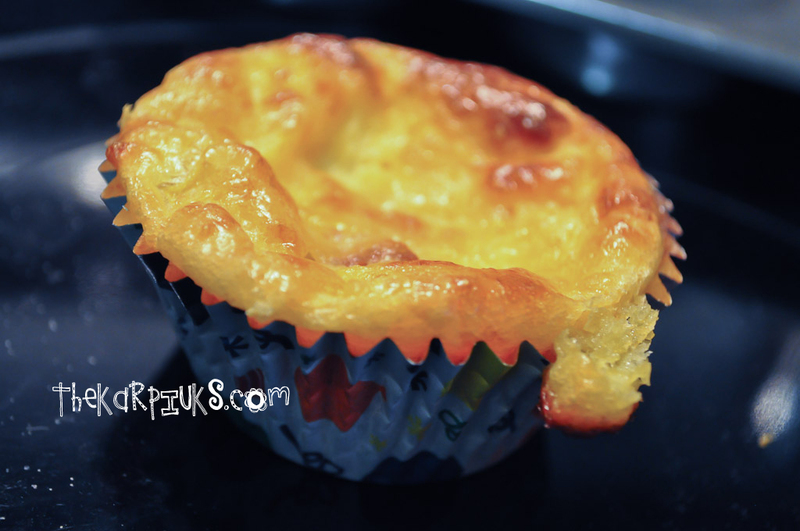 Quiche muffins are perfect for little hands, and what kid would say no to having “muffins” for dinner? Liam loved having his own, easy to hold and eat quiche and it was full of good veggies and protein. Though he would’ve liked the flavor of the quiche no matter how it was served to him, having the quiche in muffin form got him excited and guaranteed he would give it a try, and that’s half the battle when it comes to eating with toddlers. Plus it was easier to eat this way! There you have it, just add your favorite veggies and meat and you’ve created a masterpiece. Try it with spinach and ground turkey or broccoli and bacon. This could also be made into a breakfast or brunch dish easily by using breakfast sausage. Maybe you’re feeling bold and you add TWO proteins or TWO veggies! The possibilities are endless. It’s been expressed in one way or another by both men in the house that I could make this again anytime… so now the question is, what goodies will I put in my quiche this week?! P.s. The leftovers are just as good the next day for lunch!